I lived abroad and traveled abroad with this card and its fabulous. I also had my limit increased a year after I got it, so I'm not sure why other people did not get that. I love getting points for everything and no foreign transaction fees was a big yes for me! The bonuses with Preferred Rewards are great. It has no annual fee. Customer service is generally awful, but so are some other major card issuers. You cannot set up autopay before the first statement. Autopay can only be set up as ebill payments. This is true for all boa credit cards. That time you may forget to set up. I love this credit card. I love earning points for every purchase I do and I love getting money back for the trips I have done. It’s also great to know that I can get the money back from the points I have. Overall, this credit card is perfect for me. Bank of America kept freezing my card and their customer service was absolutely horrible to deal with. I am in the process of paying off this card and closing the account. It is almost impossible to use. I always pay on time and my credit score is excellent, doesn't matter to Bank of America. I have been a Bank of America banking customer since 1993, but their overall customer service has really gone done hill. I am leaving Bank of America completely and moving my banking accounts to Discover Bank, which is much better to deal with. 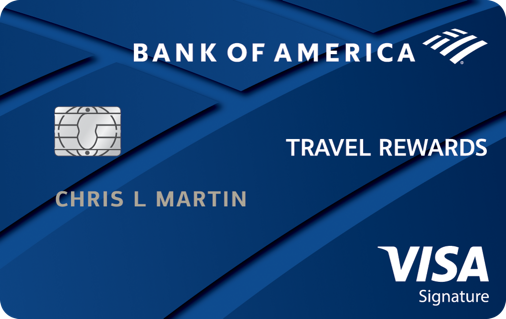 Don't expect to have a similar cashback/reward for non travel related expenditures, if you frequently travel, then this card is best for you. Own it for 2 years, points never expire and can be used for anything travel related including parking charges! No hassle, no annual fees and very simple to manage through the bank app. Best part, US based customer service! even if i repay the charges on the card before the last day, they will still charge me late fee even if i made the transcation on their business day. It takes more than 2 business day to reflect your payment and you end up paying heavy late mayment fee. From 2nd year they will charge you heavy anual fee. so stay away from this card. So you didn't know they are fee driven bank?! First off, there is no annual fee. Secondly, you shouldn’t wait until the final day of your payment due date to submit a payment. I agree. This is an excellent card..5 star all the way! Learn how to use a credit card responsibly! This is one of my first credit cards. This is my second credit card alongside my Discover It Student card. The application was straightforward; however, I am let down that my credit limit is only $500, whereas my Discover It student card had over $1000 limit. I always prepay my balances as well. I've gone back in time and applied my rewards to travel I've done up to a year prior.